What is Advantage Household Spot & Crevice Spray? There's nothing worse than knowing you have a bug problem and not being able to figure out exactly where they are coming from. That's where the Advantage Household Spot & Crevice Spray comes in handy. With just a pull of a trigger, this spot and crevice spray gets down into all the cracks and crevices of your home or apartment to kill dangerous bugs. That means you can prevent fleas, ticks, certain spiders and even bed bugs from harming your family, easily and effectively. How does Advantage Household Spot & Crevice Spray work? Advantage Household Spot & Crevice Spray contains powerful flea-killing ingredients that stop harmful bugs in their tracks. It gets down deep in the cracks and crevices of your home where fleas live and breed. 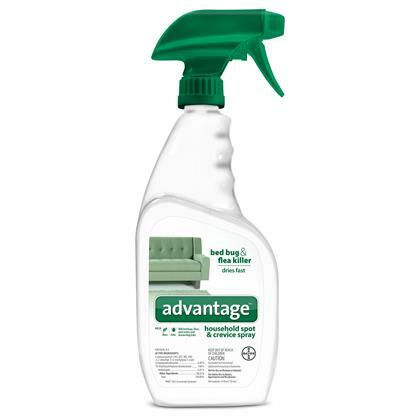 Advantage Household Spot & Crevice Spray also takes care of ticks, spiders, bed bugs and many other dangerous bugs that could be lurking in your home and around your family. Spray around your windows, doors and other openings in your home before bugs have a chance to get in. Not for use on humans or pets. Keep out of reach of children. Shake well before each use. Advantage Household Spot & Crevice Flea Spray kills all of the following: Fleas, brown dog ticks, bed bugs, ants (excluding fire, pharaoh and harvester ants), spiders (excluding brown recluse and black widow), stink bugs, boxelder bugs, clothes moths, dust mites, crickets, earwigs, millipedes, moths, multicolored Asian lady beetles, and silverfish. Instructions: Use only as a spot or crack and crevice treatment in your home. Spray the areas around your pet's bedding and floor where he or she sleeps. Also, spray around baseboards, window sills, cracks in floorboards, around sinks and anywhere insects may be living. For bed bugs, wash all bedding and spray your headboard and floorboards surrounding your bed. After spraying, vacate the room and let ventilate. Do not spray directly onto your mattress or pillows. Test an inconspicuous area in your home for discoloration. Always hold the sprayer away from you. Do not spray directly on your pet. Instead, use Advantage Treatment Spray to get rid of fleas on your pet. *MGK 264, Insecticide Synergist 24 oz. spray bottle.